Caroline Cunningham (Authentic Reflexology) designs and facilitates well-being workshops which incorporate meditation, reflexology self-treatment techniques, additional self-care strategies and empowerment for strengthening self-awareness, immunity and mental health. Creative practice can be included and workshops can be customised for each groups requirement. 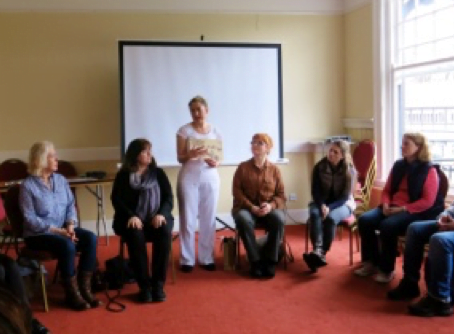 Workshops are suitable for groups of up to 12 people and can be faciliated in private homes, community centres or in corporate settings. – Contact to make enquiry and booking. Workshops do not provide CPD points and do not qualify therapists (who are untrained in reflexology) to use the techniques in their professional practice. Health Insurance: Caroline Cunningham is a registered member of Irish Reflexologists’ Institute (I.R.I.L. ), which ensures professsional standards in reflexology and qualifies clients of registered therapists to claim back costs of treatment from their health insurer once they have the relevant level of health cover.